Erected proudly on Baltic Square, the Hatton Pavilion is gleaming on a rare day of sunshine in Gateshead, the structure visible even from the other side of the Millennium Bridge. Designed by Glasgow-based artist Toby Paterson, and created in conjunction with architects Harper Perry, this temporary offsite commission is touring Gateshead and Newcastle to celebrate the Hatton Gallery’s rich history, whilst it undergoes a £3.8 million renovation. Paterson was inspired by the installation-based exhibitions Man, Machine and Motion (1955) and an Exhibit (1957) by artists Victor Pasmore and Richard Hamilton, which debuted in the Hatton Gallery itself. These exhibitions explored the constant visual overhaul as the world responds to technology and media. Reflecting on these themes, Paterson uses the geometric precision of the open-framed design to provide the viewer with alternating views as they walk in and around the Pavilion. The angular metal sheets adorning the frame invite depth by casting shadows. As time passes they shift in response to the changing light and evoke echoes of Pasmore and Hamilton’s connotations with modernist abstraction. The metal panels are boldly coloured in shades of red, yellow, light blues and greys, both in reference to Pasmore and Hamilton’s colour schemes and to also what Paterson himself describes as ‘subjective selfishness’. Pasmore and Hamilton wanted to engage with their audience on both an intellectual and visceral level. Thus posters – which include both replicas of their 1950s/1960s exhibitions, as well as newer designs by Paterson, inspired by artists such as Kenneth Martin and Eduardo Paolozzi – are to be pasted up daily onto the panels of the Pavilion throughout its tour. They will engross a modern audience by reflecting on the creative education of Pasmore and Hamilton, which is of such historical significance to the Hatton. Unfortunately, a plethora of those residing in Newcastle and Gateshead remain oblivious to this culturally rich gallery. But the nomadic nature of the Pavilion’s programme seeks to address this. As well as maintaining the Hatton’s profile during its refurbishment, the Pavilion’s relocation to various sites will attract new audiences and guarantee a peak of interest when the gallery reopens its doors. Moreover, the daily alteration of the Pavilion, as new posters are pasted on top of the previous, will ensure the installation remains visually stimulating. Whilst events such as Parkour and Tai Chi being held at the Pavilion will also further increase public interaction. The architecture of the touring installation did undergo frequent revisions. Paterson humorously remarks that it needed to be ‘nightlife-proof’, which meant the horizontal beams atop the sculpture had to be high enough so as not to be swung from. The beams, originally planned to be steel like the vertical columns, were substituted with wood due to concerns about weight; this does however provide a strong juxtaposition and a sense of journey; from the concrete bases, the steel panels and columns, to the wooden beams. The installation will be touring through till August, with future locations yet to be announced. 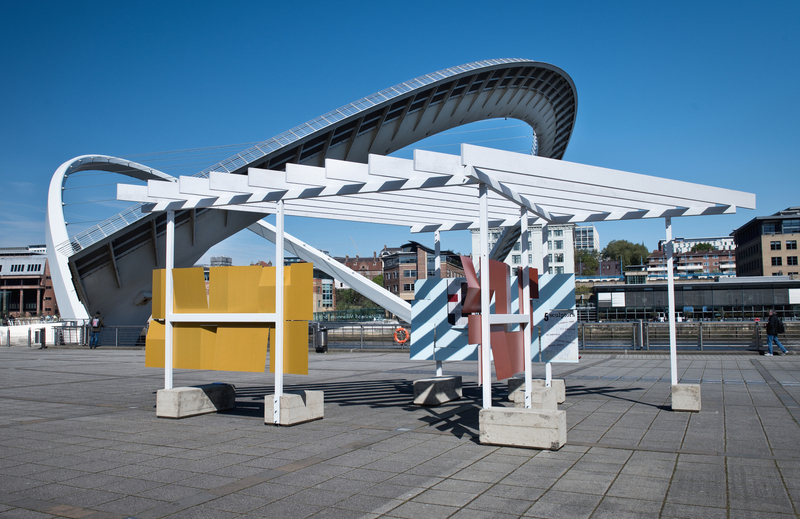 With the sculpture holding its own amidst the majestic Baltic Flour Mill and Millennium Bridge, there can be no uncertainty of the Pavilion stirring excitement in anticipation of the Hatton’s reopening. Hatton Pavilion for the Hatton Gallery, Baltic Square, Gateshead Quays, 28 April – 21 May 2017. Touring installation running until 28 August 2017 with future sites in Gateshead and Newcastle TBA. Rosie Minney is a Fine Art student based in Newcastle-upon-Tyne.